Our kids are ever-evolving wonders; not only are they growing and changing physically day-by-day, they’re personalities and interests change just as quickly! This is all part of growing up and can sometimes feel difficult to keep up, especially when you want to create a space for them that expresses their individual quirks. 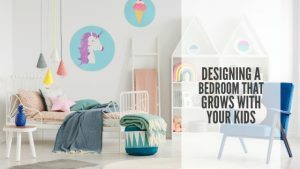 Truthfully, it can be really expensive and time-consuming to constantly update your child’s room to keep up with their changing interest, but it’s possible to design a space that your kids will love and grow into for years to come. Choose neutral colors instead of a bold, specific color for the walls. This will keep you from having to repaint later when your child decides green is no longer their favorite color. Colors like white, light gray or even pastel shades work well. If your child insists on picking a color, find a middle ground of allowing them to choose a general color but allowing you to pick the shade. We’ll admit: those kid-sized tables and chairs are adorable but your kids will quickly outgrow those smaller furniture pieces. Purchasing new furniture pieces every few years may not be feasible so it’s best to invest in quality pieces that you child can use for years to come. Convertible furniture, like cribs that convert from a crib to a toddler bed to a double bed is a great place to start. This is where you can let your kid’s personality shine. Soft furnishings and accessories require a lower level of commitment and are easier to change as your child grows and interests change. Since you have a neutral wall color, you have the most flexibility to create a playful and whimsical space. Round out your child’s interests and personality with theme-appropriate bedding, pillows and artwork (all of which can easily be replaced as needed). Vinyl wall “tattoos” are another great option to follow a theme without the full commitment of painted murals. FCB Homes has several communities in throughout the Central Valley. To view our new home communities, visit us at FCBHomes.com.